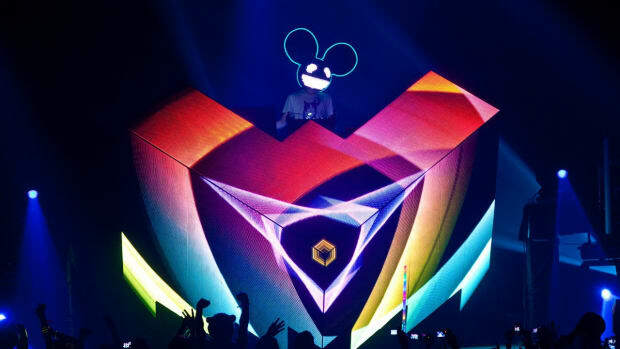 Why is it that when we hear the name Eminem we think of his incredible music and accomplishments, but when we hear the name deadmau5 we think about his off-stage personality rather than “Strobe” or “I Remember”. Is deadmau5 opinionated? Absolutely. Is he a troll? 100%. But don’t we all have our moments? Look at any post on deadmau5’s Twitter and you will surely see a handful of replies on every post harassing him. The amount of online harassment he receives is absolutely incredible. 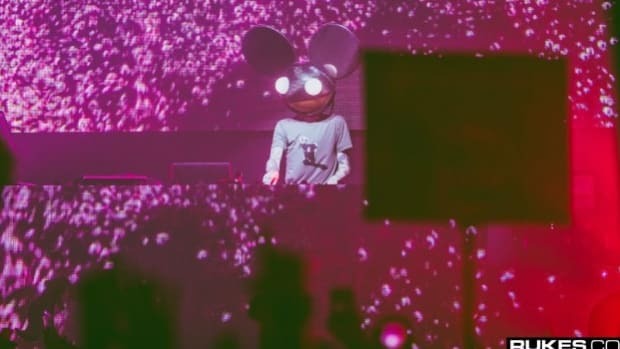 I&apos;m no rookie to this music stuff and I&apos;d like to think my knowledge of artists is pretty extensive, but I legitimately cannot think of an artist who receives even half as much of the harassment deadmau5 receives. Some of you might say that you wouldn’t care about any of this if you had as much money as him, but would you really? It’s one thing when a buddy picks on you every once in awhile, but to be harassed at all hours of the day/night sounds terrible. Artists get sick, sleep past their alarm, forget to brush their teeth, and deal with everyday problems big and small just like all of us. Many people fail to realize this. Your life doesn’t instantly become perfect once you reach fame and fortune. Sure, certain aspects of life are easier, but for every old problem that money and popularity resolves a new problem created by the stardom pops up in its place. A colleague of mine wrote an excellent article showcasing a study which found that depression affects a large percentage of musicians. 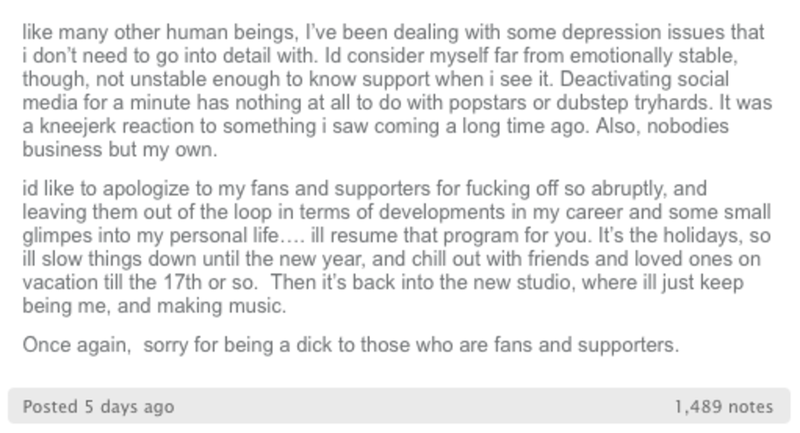 Back in 2015, deadmau5 posted a note to his Tumblr in which he explained a bit about his personal battle with depression. This post was created in response to him deleting his social media accounts for a temporary time. Although he didn’t go into too much detail he made a point to apologize to his fans and supporters for his behavior. However, I don’t believe that is important take-away here, which leads us to my final point. 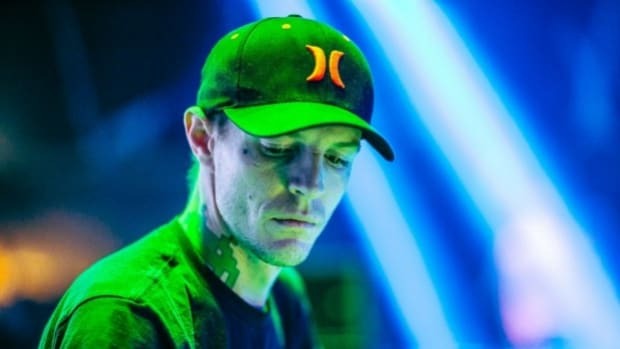 Deadmau5 tells his fans he is sorry for “leaving them out of the loop in terms of developments in my career and some small glimpes into my personal life”. When did it become necessary for artists to do this? Have we become so social-media obsessed and intrusive that we must know everything about our favorite artist’s lives? It’s like we’ve built a culture that has forced artists become their own paparazzi. Why is it imperative for Dillon Francis to show us the pizza he’s cooked? 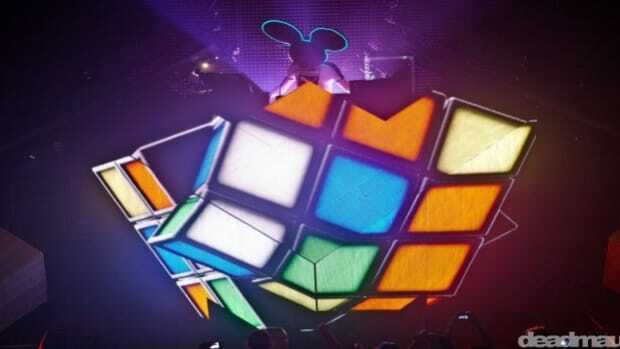 Now this could just be deadmau5 being considerate to his fans who enjoy the look into his life. But the point I am trying to make is that artists shouldn’t feel obligated to give us this look. The only time artists should feel obligated to entertain is when they’re on stage, anything else should be optional. This could even explain why more and more artists are going completely anonymous. (Don’t worry, I won’t mention the artist who’s name rhymes with smarshsmellow in a piece about deadmau5.) Medium’s Cuepoint has an interesting piece on this very topic. British electronic artist Burial explained that the only reason for hiding his identity was to make fans focus on his music. 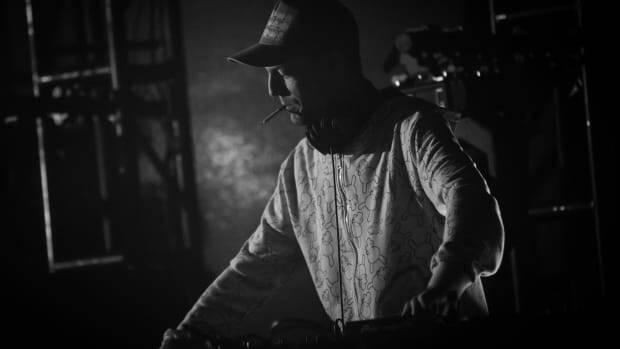 All of these things have lead me to believe that maybe deadmau5 isn’t a bad guy, but rather, the culture and entitlement of dance music fans have created this image of him as a villain. As a fan base we should take steps to make the music the priority again. Let’s step away from the entitlement and see anything else outside of music as a bonus. It’s time to start treating artists like human beings. Their job is not to entertain you 24/7. Say these things a few times out loud before you harass an artist online. But if you really can’t contain yourself, at least take #plur out of your bio. 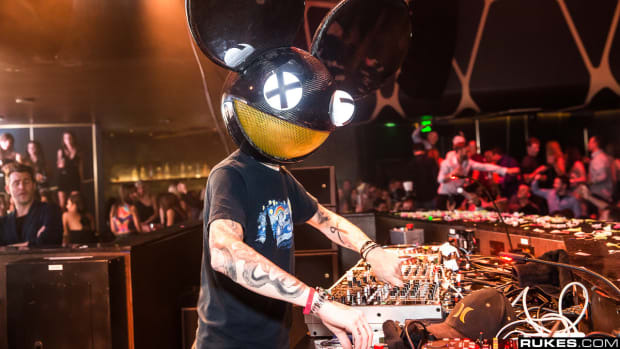 Deadmau5 subtly reveals a new album is in the works! He knows exactly how to get us excited!